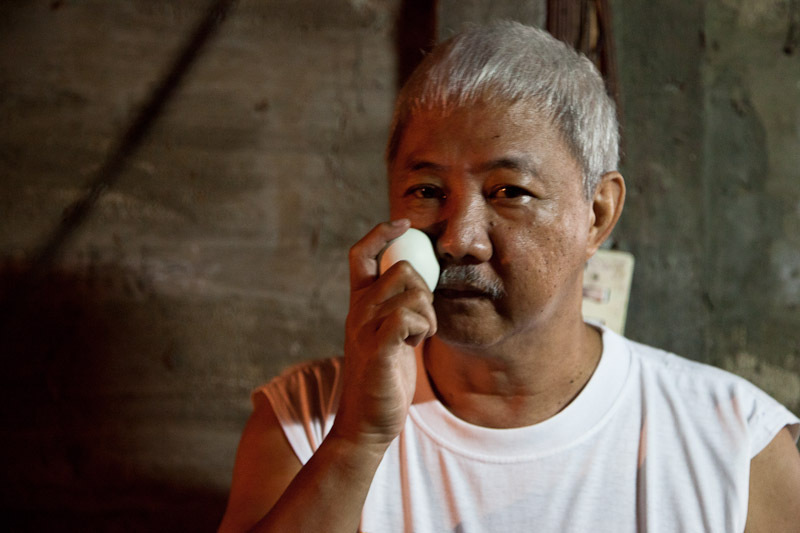 Carlito Capco has been surrounded by balut his whole life. 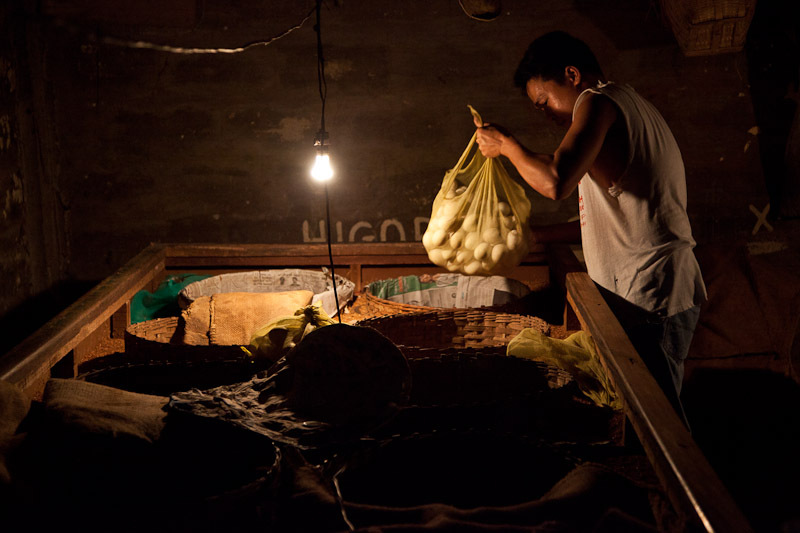 He’s the head of the biggest traditional balut factory in Manila, in the lively district of Pateros. Before him, his father was doing the same thing, and before that, his grand-father too. The use the very specific Filipino method, perfected for centuries, and are proud of it. Here, the techniques and tools are transmitted from one generation to another. And the whole family helps preparing the eggs, it’s a family affair. Since Carlito was born, only one thing changed at the Capco factory: the don’t have ducks any more. The used to have a lot of them, breeding them close to the river, but the Marcos era changed a lot the habits in Pateros. In the 70′s, during the State of Martial Law, all the people seen as trouble were expelled from Manila. 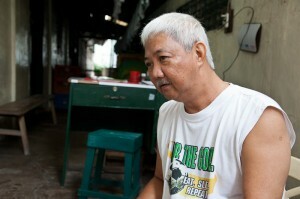 They were settling in Pateros, close to the capital but still independent at that time. Very quickly, there has been a problem of overpopulation in Pateros, which had two consequences: first, there was no more room for ducks. The priority was to find some space to accommodate people. Second, more people means more pollution, and the river became too disgusting to breed anything but mosquitos and flies. 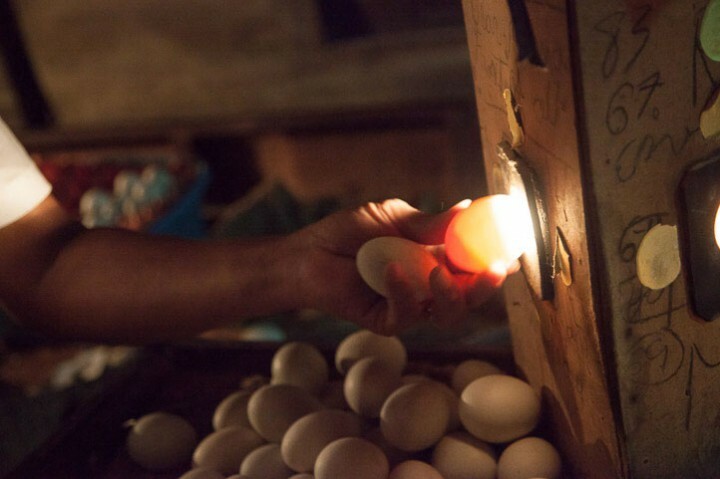 Today, the eggs the Capcos use come from Pampanga and Bulacan, two rural provinces that basically feed Manila. Most of the fruits and vegetables come from there. Carlito orders 30,000 eggs each week. They arrive fresh. First they need to be tested with a “high-technology gadget”, as Carlito says, a weird lamp with a hole in it. They put the egg in the hole, to be able to see through the shell. This way, they can check if there is an embryo or not. If there is no embryo, the egg will become a salted egg, I’ll talk about that later. If there is an embryo, bingo, it will be incubated in a special place. The fertilized eggs must be incubated in warm place, far away from the sunlight. The are nested in bamboo baskets that are put in chaff (the outer husks of the rice grain), in a special room without any light. The chaff must dried before use, to kill all the potential bacteria that could contaminate the eggs. In each basket, they put 10 layers of eggs. The temperature is checked regularly, and the eggs must be rotated every day to be sure that the temperature is homogeneous. Carlito cannot really tell me what’s the ideal temperature. He doesn’t check with a thermometer. He has a special way to do it. He takes each egg in his hand and sticks it to his face, North-East of his mouth, South-East of his nose. This gesture is very gentle, almost fatherlike. The egg must feel warmer than your skin. The ducks have a body temperature around 41,1°C. That’s about the exact temperature they manage to have in the bamboo baskets. They will then check the development of the embryo twice with their funky lamp, the first time on the 10th day of incubation, then on the 18th day. Depending on what they’ll see through the shell, they’ll classify the eggs in different categories. First you have the penoy, in which no embryo developed. They’ll stop the incubation for those ones after 18 days. 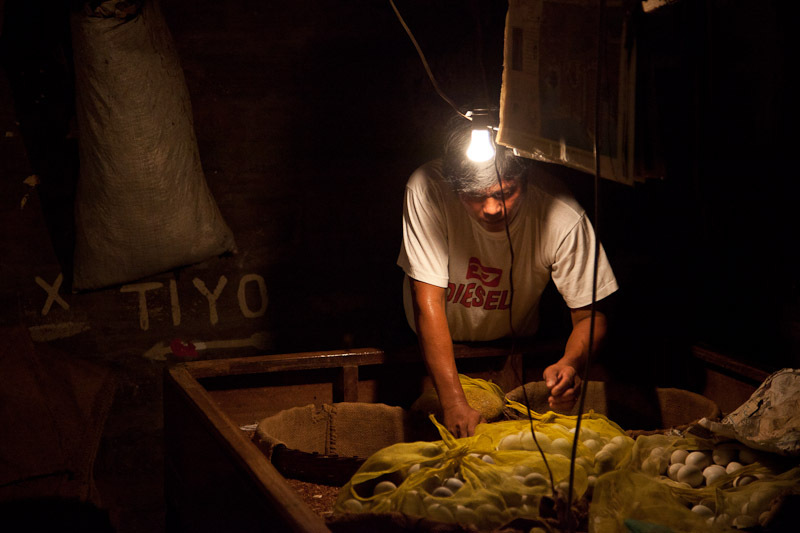 Then there is the balut sa puti, the “first class balut”, the main product of the factory. This one will stay in its basket a bit longer, 21 days. And there are the abnoy eggs, or abnormal eggs, that are rotten. Those can still be sold, they will be eaten scrambled. My friend Al, who used to be an excellent soccer player, tried to explain me precisely the word abnoy. The abnormality can be physical or mental. Basically, the idea will be close to “degenerated”. To confirm I was understanding correctly, I showed her a picture of Franck Ribery, a famous French soccer player known for his scary face and his love of underage prostitutes. First she laughed, then she looked at me, full of emotion, and said with pride: “You’re a real Filipina now.” Sorry, let’s go back to the eggs. It’s hard for Carlito to say how many eggs he produces. Because each time, they get a different amount of fertilized eggs out of the 30.000 the use. And those fertilized eggs will then have a random development. Still he has the biggest production in the region. He even sends some of them to provinces in the Visayas. I can testify, I found some of his balut in Coron, Palawan! I was so surprised when the vendor told me they were from Pateros… Since the avian flu, there is no way to export them in other countries though. Airport authorities would never allow it. Though it is only national, Carlito’s market is getting bigger and bigger, as the Filipino population does. And as the concurrents stop their activity when they retire, because their kids have something else in mind, his factory is a very successful business. Most of the vendors in Manila get their eggs here. Balut is very nourishing and filling. Only one egg has more than 180 calories. With a bit of rice, it’s a full meal. It’s a common dinner for workers who need to get some strength after a hard day. Besides, it’s very cheap: 12 pesos (20 euro cents) are enough to get eggs and meat in the same product. And it can be eaten quickly, and anywhere. Sold. 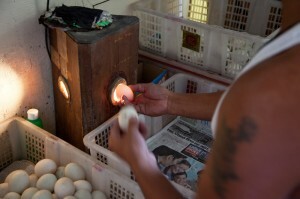 They also sell a lot of balut to students and pupils. It’s supposed to be “brain food”, as Carlito says. There are always vendors around the schools and universities. And there again, the kids having not much money, the price of the balut, compared to the energy it provides, makes it a very attractive option. According to him, “balut” is the secret password of Filipino Overseas Workers. “We look like Indonesians, or Malays”, he explains. “If you just look at their faces, you won’t be able to tell if the people you see are from the same country as you. Just say the word ‘balut’, and you’ll see. Only Filipinos will turn to look at you.” He told me to try it at home, in Paris. Will do, promise. Apart from that, still no balut for me today. They did not offer, I did not try to get some. I know it’s disappointing, but at 9 in the morning, you have to be really in a good condition to eat fresh embryos. I just had some salted eggs, and I’ll tell you all about that very soon.